Only time will tell if fans of long-running death metal crew Nile will have to endure the eternal molestation of flame, but at least they won't have to suffer much longer before the band get back on the road in support of 2012's Exclaim!-approved At the Gate of Sethu. The group have revealed plans to rep those songs and more next spring on a lengthy North American tour. 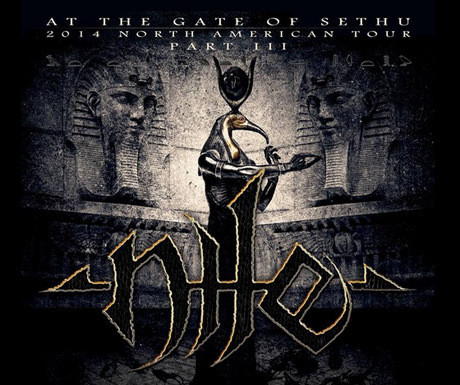 The band's plans were revealed over the weekend on Facebook, with Nile confirming they'll be out crushing it from mid-April to mid-May for the third leg of their "At the Gate of Sethu" tour. The lion's share of the dates take place in the U.S., but the band will bring their ancient Egypt-influenced catalogue to Canadian clubs in Montreal, Quebec City, Ottawa, Toronto and Vancouver. Support acts have not yet been named, but Nile plan on plucking local talent from each city visited. You'll find all the details for the show schedule down below. While the trio will no doubt be barreling through tracks from At the Gate of Sethu, the group report that these shows will cascade through their audio annals, performing career-spanning sets that will feature "several never-before-heard-live Nile songs."